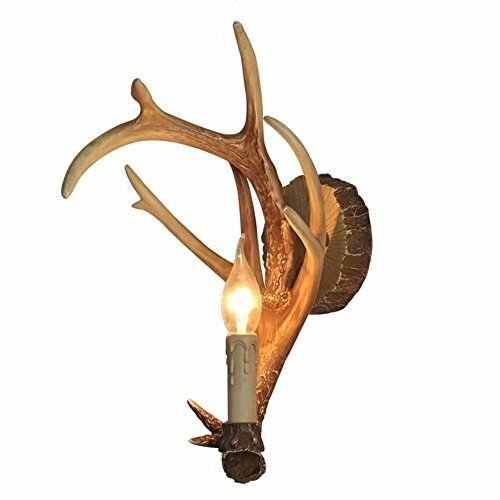 YHF Resin Antler Wall Sconce 2 Light 14.6"
EFFORTINC Resin Antler Wall Sconce 2 Light 14.5"
Features:Retro faux Antler Wall Sconce Style:Antique/European/Retro/Vintage Suggested Space Fit: Living room,Bar,Cafe, Dining room, Bedroom,Study,Villas Suggested Room Size:15-30O Fixture Height:48cm (18.9inch) Fixture Width:37cm (14.5inch) Fixture Length:48 cm (18.9 inch) Voltage:110-120V Number of Bulbs:2 Bulb Base:E12 Wattage per Bulb:2xE12xMax 40W Bulb:Bulb Not Included Fixture Material:Polyresin, Metal Fixture Color:Antique Net Weight:2.5Kg Our Rustic Wall Sconce is the best faux antler Wall Sconce available on the market. We have taken our replication process from our other rustic decor items and matched the authentic finish. 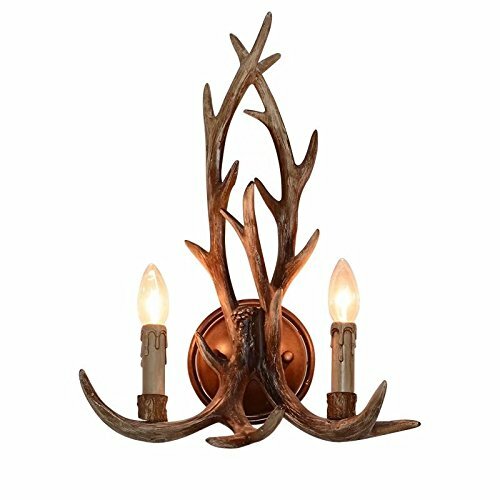 Real antlers are used to model the reproduction for an exact and comparable result. The process to create the antler Wall Sconce uses a time proven, cast resin system to ensure perfection in every piece. We have hand-stained and antiqued each antler to achieve the exact comparable match to the real antler. Bring the perfect rustic decor to your home, cabin, office,dining room tables, living rooms, offices, or anywhere you want to hang them to create the perfect, natural look in any room. 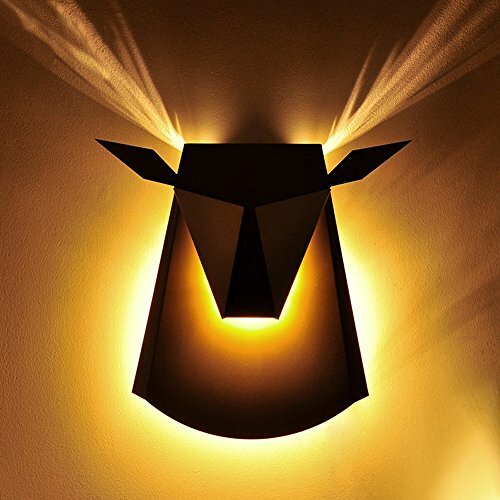 [name] double-headed antler wall lamp [Material] environmentally friendly resin [process] resin [Light source] E14 spiral lamp head [Size] width 38cm* height 50cm [packaging] carton plus foam Please check the damage as soon as possible after receiving the goods. If you have any questions, please contact us as soon as possible and provide photos. We will provide the best solution in time. Since the lamps and glass are fragile, we will charge a fee at the cost price to assist with the replacement after more than 24 hours of damage. Hope and thank you for your understanding! 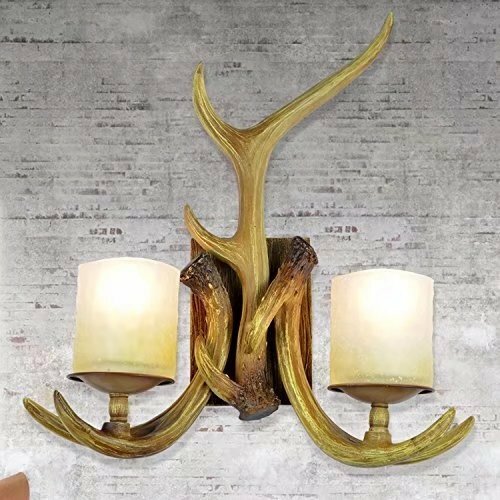 Features:Retro faux Antler Wall Sconce Style:Antique/European/Retro/Vintage Suggested Space Fit: Living room,Bar,Cafe, Dining room, Bedroom,Study,Villas Suggested Room Size:15-30㎡ Fixture Height:49cm (20inch) Fixture Width:42 cm (17.1 inch) Fixture Length:49 cm (20 inch) Voltage:110-120V Number of Bulbs:2 Bulb Base:E26 Wattage per Bulb:2xE26xMax 40W Bulb:Bulb Not Included Fixture Material:Polyresin, Metal Fixture Color:Antique Net Weight:4.5Kg Our Rustic Wall Sconce is the best faux antler Wall Sconce available on the market. We have taken our replication process from our other rustic decor items and matched the authentic finish. Real antlers are used to model the reproduction for an exact and comparable result. The process to create the antler Wall Sconce uses a time proven, cast resin system to ensure perfection in every piece. We have hand-stained and antiqued each antler to achieve the exact comparable match to the real antler. Bring the perfect rustic decor to your home, cabin, office,dining room tables, living rooms, offices, or anywhere you want to hang them to create the perfect, natural look in any room. 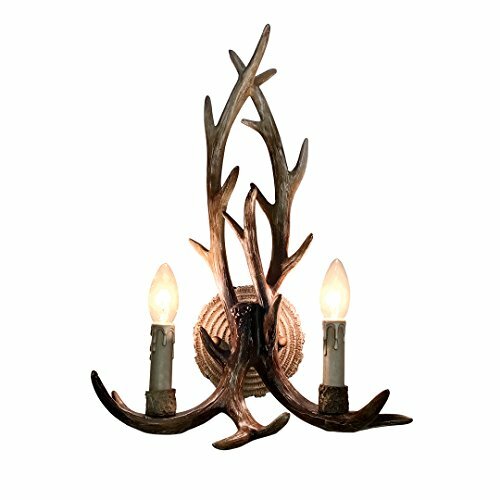 Features:Retro faux Antler Wall SconceStyle:Antique/European/Retro/VintageSuggested Space Fit: Living room,Bar,Cafe, Dining room, Bedroom,Study,VillasSuggested Room Size:10-15?OFixture Height:25cm (9.8 inch)Fixture Width:28 cm (11 inch) Fixture Length:28 cm (11 inch) Voltage:110-120V Number of Bulbs:1Bulb Base:E12Wattage per Bulb:1xE12xMax 40WBulb:Bulb Not Included Fixture Material:Polyresin, MetalFixture Color:Antique Net Weight:1.2 KgOur Rustic Wall Sconce is the best faux antler Wall Sconce available on the market. We have taken our replication process from our other rustic decor items and matched the authentic finish. Real antlers are used to model the reproduction for an exact and comparable result. The process to create the antler Wall Sconce uses a time proven, cast resin system to ensure perfection in every piece. We have hand-stained and antiqued each antler to achieve the exact comparable match to the real antler. Bring the perfect rustic decor to your home, cabin, office,dining room tables, living rooms, offices, or anywhere you want to hang them to create the perfect, natural look in any room. 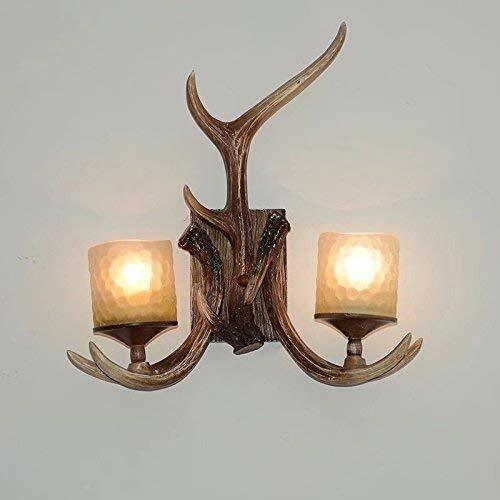 Features:Retro faux Antler Wall Sconce Style:Antique/European/Retro/Vintage Suggested Space Fit: Living room,Bar,Cafe, Dining room, Bedroom,Study,Villas Suggested Room Size:15-30㎡ Fixture Height:50cm (20.4inch) Fixture Width:35 cm (14.2inch) Fixture Length:50 cm (20.4 inch) Voltage:110-120V Number of Bulbs:2 Bulb Base:E12 Wattage per Bulb:2xE12xMax 40W Bulb:Bulb Not Included Fixture Material:Polyresin, Metal Fixture Color:Antique Net Weight:2.5Kg Our Rustic Wall Sconce is the best faux antler Wall Sconce available on the market. We have taken our replication process from our other rustic decor items and matched the authentic finish. 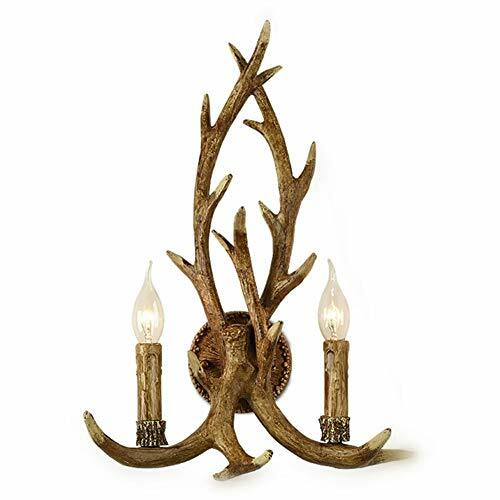 Real antlers are used to model the reproduction for an exact and comparable result. The process to create the antler Wall Sconce uses a time proven, cast resin system to ensure perfection in every piece. We have hand-stained and antiqued each antler to achieve the exact comparable match to the real antler. Bring the perfect rustic decor to your home, cabin, office,dining room tables, living rooms, offices, or anywhere you want to hang them to create the perfect, natural look in any room. 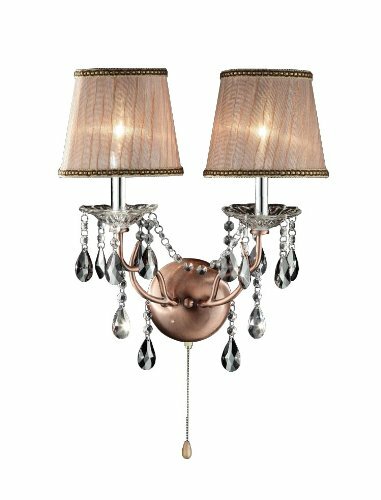 17-Inch Rosie crystal wall sconce. Deer antler inspired lamp. Copper finish with matching shade. Mix of clear and black hanging crystals. It's for any of room. The instructions are included and easy to install. 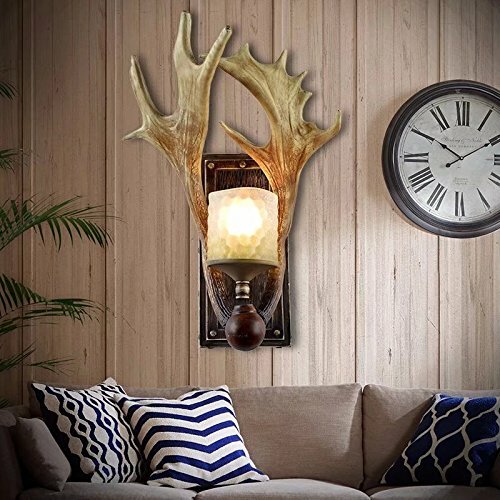 1:High-quality Wall Sconce, the design is very perfect by the majority of customers like.2:Faux antler fixture adds clean and crisp style to your decor while keeping it nice and simple.3:Creative design and retro style-----Apply to all indoor space such as Living room, dining room, kitchen,bedroom, restaurant, hotel, bar, coffee shop, etc4:Eco-friendly resin lamp body---whole lamp body made of high quality resin, strong and solid, corrosion resistant, scratch-proof, With a little bit of retro elements, suitable for various decoration styles.5:Body Material:Resin(Not the real antlers),but hand-stained and antiqued each antler to achieve the exact comparable match to the real antler.Tips: 1:This item needs your own assembly. Please istall it refer to the instruction step by step. If you have any problem with the installation, please contact us immediately.We'll try our best to help you to solve it. 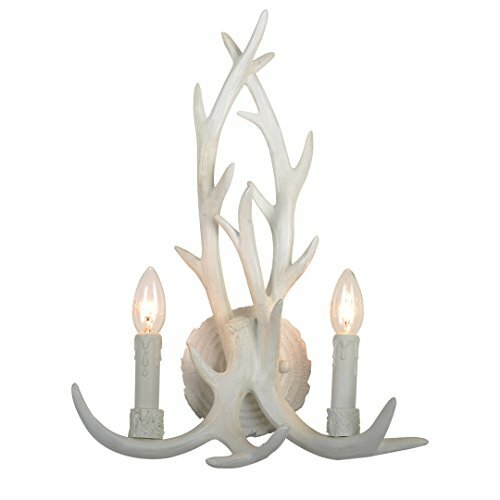 Compare prices on Antler Two Light Wall Sconce at Elevelist.com – use promo codes and coupons for best offers and deals. We work hard to get you amazing deals and collect all avail hot offers online and represent it in one place for the customers. Now our visitors can leverage benefits of big brands and heavy discounts available for that day and for famous brands.